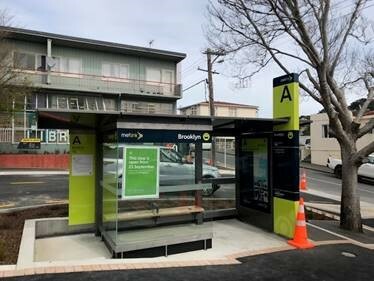 Greater Wellington Regional Council was undertaking a major revamp of its bus services, looking to improve service levels while cutting bus congestion in the central city. As a key part of this strategy, eight transit hubs were needed to connect suburban routes to high-frequency, high-capacity, central city services. In order to make the transfer experience as good as possible, hubs needed to be very user friendly, with improved comfort, shelter, security and information. This meant more glass for better visibility, lighting at night, and CCTV cameras – but there were no existing products available to do all this. Is anyone up to it? “We engaged Isthmus architects and collaborated with Wellington City Council to find a suitable solution. Our tender sought ‘Early Contractors Involvement’ (ECI) in order to engage the successful supplier to bring their manufacturing expertise to the detailed design phase. Metco showed the kind of “can do” spirit we were after and we invited them to come on the journey with us – putting them in the crucible to satisfy the exacting demands of our architects and engineers. “We really appreciated Metco’s personal engagement, explaining why one design was better than another. We saw real ‘design intelligence’ and were assured that they would find the smartest and most efficient way to do things. They attended to the fine details that customers might not even notice such as weather tightness and structural elements that could withstand extreme conditions. “Metco showed us what was possible and what their machines could achieve. Alternative options became feasible by getting their direct feedback, so we could quickly arrive at an optimal solution for fabrication. The final design satisfied our brief in a real-world ‘as-built’ situation, with a more efficient design than we’d get from the traditional process of ‘here’s the drawings, build that please’. The modular approach makes the bus hubs easy to manufacture, with flexibility to add or change components without changing the basic design. Their design smarts have proved the old adage that one hour’s planning saves four hours work. Metco’s enthusiasm and expertise have really been key to making this project happen and to realise the full potential successfully.